sailboat. 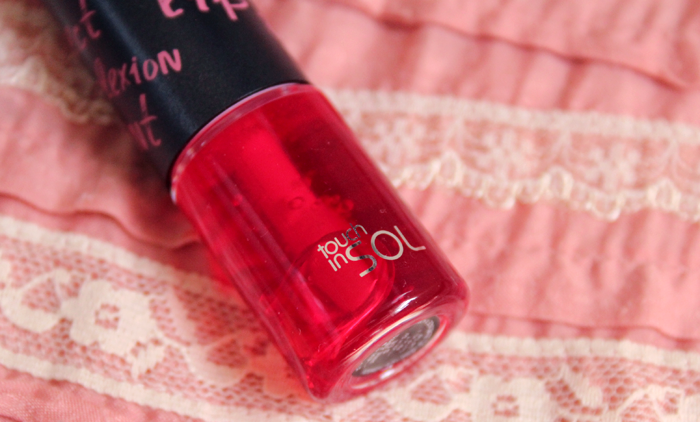 : Review: Touch In Sol Perfect Complexion Lip Tint in Crystal Cherry. Review: Touch In Sol Perfect Complexion Lip Tint in Crystal Cherry. Low maintenance lip products are my go-to at the moment, I'm loving sheer tints of colour in long lasting formulas. The Touch in Sol Perfect Complexion Lip Tint in Crystal Cherry is perfect for helping to achieve that barely there make up look and it very much reminds me of Benefit Benetint but with a nicer, easier to apply formulation - it's more affordable too! The liquid gel tint glides over the lips leaving the perfect amount of colour without settling into any dry areas. It doesn't dry instantly so you have a little bit of time to work with it to get an even colour over your lips and it has a slight cherry scent, which I think is nice. Most importantly, it lasts really well. It's not one of those products I can apply in the morning and the colour will still be somewhat visible in the evening, but it lasts a good few hours and through copious cups of tea before I have to reapply. I haven't tried it on my cheeks yet because I'm not really a fan of liquid blushes but it has definitely become a favourite lip product. Touch In Sol is a brand that until very recently I hadn't heard of before. They sent me a little box of goodies, I've been trying them out and overall I'm very impressed. 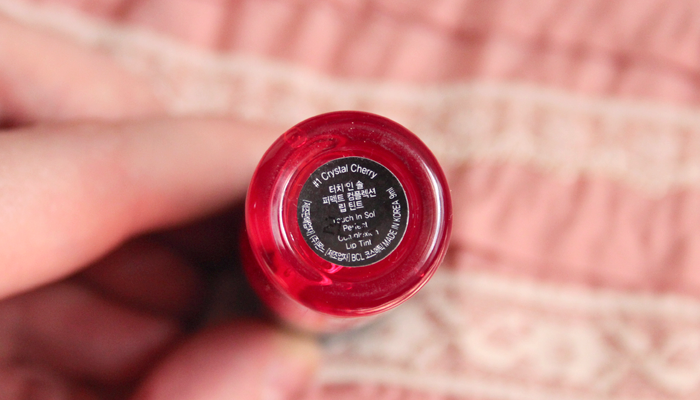 There are a couple I'm not crazy about which I will review very soon (because I think it's as helpful to explain why I don't like something as it is to explain why I do) and there are some, like this lip tint, that have become staples in my collection. That looks SO pretty! I think it's really just a "my lips but better" lipgloss type of product :) Great post! That's so lovely! I'm going to keep my out for that. I love the barely there colour. This is so pretty. I love subtle lip colours for during the day! This is really beautiful, lip tints are my favourite type of lip product! This looks so nice on you! Haven't heard of that brand but definitely sounds like a good alternative to Benetint, which I find hard to apply! I've never tried anything from this brand before, but this product looks gorgeous, so subtle and pretty! I've never seen this brand before, is it available in the UK? Love the colour and the natural effect it has on your lips! love the little colour it gives! Love this so wearable for everyday. I haven't heard of this brand either love finding new brands though :)!